expanded wit representations of plants, animals, birds and humans and a nippled jug is added to the repertoire of shapes. During the middle cycladic period people continued dealing with the trade and agriculture. 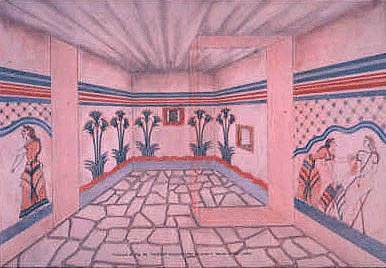 They lived now in small fortified cities with streets, sewage system and rich houses, often decorated with frescoes that testified Cretan effect. Also, a female deity was worshiped, a holy which was found in Agia Irini of Kea island, along with clay statues of her. Their cemeteries were found outside the settlements, the small children however were placed in pots and many times were buried inside the settlement. Their art became known through the pottery: the early cycladic tradition continued , but was also presented a new black painted technique (mat). There was a close contact with Crete, although minyan vases from Greek mainland have been found.